We are working hard to find new solutions everytime to Bypass FRP from our Samsung devices, so here we share with you a new method to Bypass FRP Google Account Samsung J6 Without PC, This is the latest method to Bypass FRP Samsung J6 without PC easily, to performing this method you need some applications and another Android device. we all know Samsung has added new security features on there Galaxy series (Android-8.1) devices. 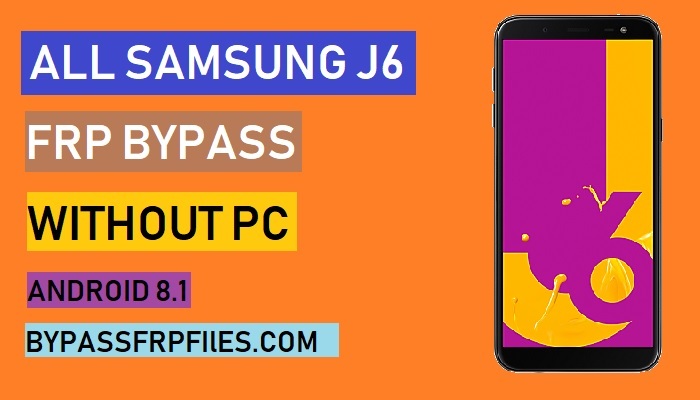 to Bypass FRP Google Account Samsung J6 Without PC you have to follow this process fully. Note:- Bypass FRP Files not responsible for any damege on your device please try this at your own risk. Note:- This method we tried for Samsung SM-J600G, you can try also some other J6 Models. FRP is (Factory Reset Protection) for our Latest Android devices, if you forget the Pattern, Password and finger print lock for this you have to hardreset your device by using keys, after you hard reset your device then you need to enter the previously synced Gmail ID to using your access your device home screen once again, then why we need to Bypass? its very simple answer if we forget the Gmail ID that we enter synced previously on our device, then you need to Bypass FRP Samsung J6 and use our device once again, now follow the below process very carefully to Bypass FRP Google Account Samsung J6 easily. -Then connect your device to a working wifi network. -Once done, then you insert a valid sim card on your device. -Once you download the apk file on your other Android device, install the Apk file on your other android phone. -Once you open the apk file then tap on the “Wap Push SL” opion from there. -Then on the, first tab you have to enter the “Phone Number”, and then select “USE No URL Prefix”. Make Sure:- You have to entered the lock device phone number there. -Once you did, then on URL type the following URL there, www.youtube.com/gadgetsdoctor” there and send the SMS from there. -Wait few seconds, then check your device you get popup sms on your J6 device. -Then hit the “Ok” button from there. -Now you need access the web browser for download some FRP files to easily Bypass FRP Google Account Samsung J6. -After that, tap on the “User Icon” from the top right corner on your device. -Congrats now you will successfully access the “Chrome” browser on your device. -Now on the “Chrome” browser tap on the “Accept & Continue” and then tap “No thanks”. -Then on the top bar of your “chrome” browser you will get a serach bar, just tap on that search bar and type there “Bypass frp Gadgetsdr” then hit the search button. -Once you get the search results, then tap on the first website from there, website URL should be starts with “gadgetsdr.com”. -But at first we need to download only one applications thats help you to Bypass FRP Samsung J6 without PC easily. -Once you downloaded the apk, then you will get a popup button on your buttom bar of your device, simply tap on the “open” button from there. -Just click on the “Done” button to Bypass FRP Google Account Samsung J6 easily. -Once you Sign in with your gmail id then this applications will automatically closed. -Now you have successfully Bypass FRP Samsung J6 without PC easily. Thanks for visiting us, if you facing any problem with this Bypass FRP Google Account Samsung J6 method then you can comment us on below.